By mounting a coin in a coin bezel you are able to turn your rare and collectible coins into coin jewelry. Follow the easy directions below to secure the coin in your coin bezel. When choosing your coin bezel, use our coin bezel size reference chart to assure a good fit. You will need a jeweler’s screwdriver with a small flat blade; we suggest one that has a blade measuring from 1.0 – 1.20 mm in width. Use the screwdriver to first take the small screw out of the fitting of the coin bezel. 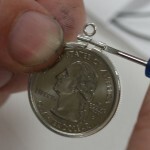 Once the screw has been removed, you will be able to slightly open up the bezel so your coin can be slipped into place. 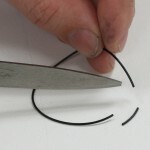 Important: Be careful when spreading the coin bezel open that you only bend as far as needed to slip the coin into place to prevent bending or kinking the coin bezel out of shape. Once the coin is in place pressure the gap of the bezel tightly and put the coin mounting screw back into place. While putting the screw back into place make sure not to over tighten it which will cause the screw and its fitting to get stripped. The coin is now securely mounted in the bezel and from here can be used to display your coin. 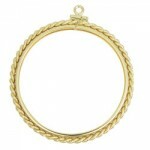 If you wish to hang your coin bezel from a chain you will need to use a jewelry bail. Determining what type of bail will be appropriate involves a few different factors. First determine the thickness and width of the chain you have to make sure the chain will be thin enough to fit through the inside of the bail. If you are unable to do soldering work we suggest using a “snap on bail” which doesn’t require soldering in order to use it with your coin bezel. If you are able to solder a bail to the attachment ring of the coin bezel, please visit our jewelry bails page to see all styles of gold and sterling bails we have available.